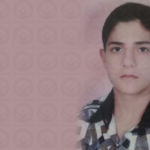 Human Rights Activists News Agency (HRANA)- Sanandaj prisoner Shayan Saeedpour, now 20, has been sentenced to death by Judge Vafayian in Branch 1 of Kurdistan Criminal Court for a murder he committed at age 17, at a time that he may have been under monitoring for a psychiatric condition. A member of Saeedpour’s family told HRANA that the young man stands accused of murdering Soleyman Azadi in a scuffle on August 16, 2015, just two months shy of his 18th birthday. “Saeedpour said he was acting under the influence of bootleg alcohol and wasn’t in his right mind,” the source said. Saeedpour turned himself over to police two days after the incident, accompanied by his father. The attorney added that Saeedpour didn’t know the victim prior to the incident. Seeking a second opinion, the case investigator sent the case to the Kermanshah coroner, who concurred with the initial evaluation. In addition to the death penalty, Saeedpour was sentenced to 80 lashes for drinking. A close source shared with HRANA that Saeedpour was once a member of a traditional Iranian gym. Previously the bodybuilding champion in his province, he once placed third in a national tournament. The punishment of children — particularly death sentences for minors caught up in skirmishes, crimes of passion, or the drug trade — remains one of the premier human rights battles in Iran. Iran has been a signatory to the United Nations Convention on the Rights of the Child for the past 25 years. 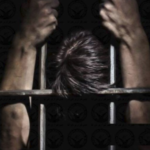 Article 37 of the Convention reads, “Neither capital punishment nor life imprisonment without possibility of release shall be imposed for offences committed by persons below eighteen years of age”. In 2017, at least four juvenile offenders were executed in Iran after their 18th birthday. Since the beginning of 2018, multiple child offenders have been executed or sentenced to death. Human Rights Activists News Agency (HRANA)- HRANA has identified Leila Tajik’s co-defendant and former spouse — sentenced to death on espionage charges, per a HRANA report dated October 11, 2018 — as Seyed Jamal Hajizavar, 47, a former staff member on the IRGC Aerospace Force. In the same report, HRANA reported on Tajik’s sentence of 15 years’ imprisonment in exile for the same charges, ruled in Branch 4 of Tehran Military Court. Pursuant to a joint case opened up against the two by the IRGC intelligence unit, the former couple was arrested September 5, 2017, and held in an IGRC outpost. Tajik was later transferred to the Evin Prison Women’s Ward on March 19, 2018. Over the course of his 14-month detainment, reports of Hajizavar’s violent torture — including de-nailing and electric shock in so-called “death cells”– have been conspicuously absent from the state-run news media. Human Rights Activists News Agency (HRANA) – Prisoner Sami Mohtarami, 43, was executed in Ardakan Prison on the morning of Saturday, November 3, 2018. Convicted of murdering someone while stealing a car, Mohtarami had been detained in Ardakan Prison since 2015. He previously served a five-year sentence in Ardakan on drug-related charges. Ardakan is located in the central district of Ardakan County, Yazd Province. Human Rights Activists News Agency (HRANA)- The Iranian Supreme Court has upheld the death sentence for Davoud Mir Hosseini, a 42-year-old married man accused of murder. 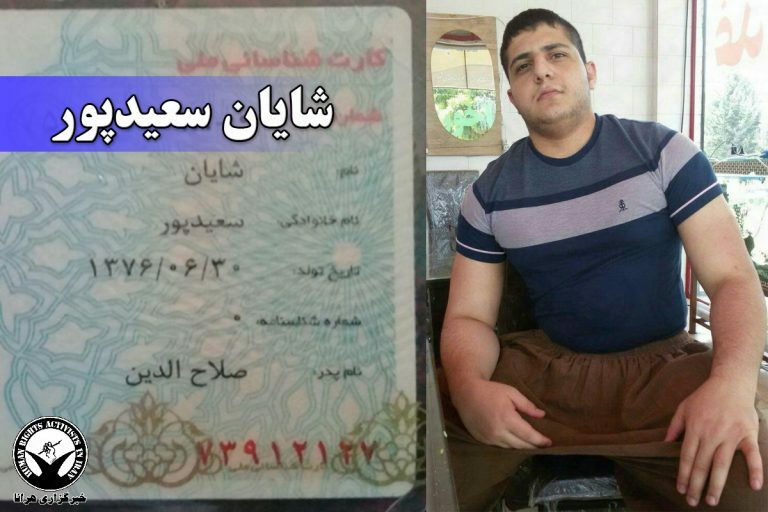 First arrested in 2014, Mir Hosseini has been detained in Nishapur, in the northeastern province of Razavi Khorasan, ever since. Mir Hosseini must now square off with the same anguishing fatality he once lawfully escaped: the Supreme Court previously reversed the death sentence issued to him in Nishapur Public Court Branch 3, but when the would-be closed case was forwarded to a parallel appeals court in 2017, authorities ruled back in favor of capital punishment. As announced by Mir Hosseini’s lawyer last week, the Supreme Court has moved to uphold it. 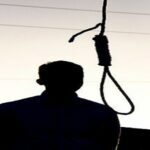 Human Rights Activists News Agency (HRANA)- At dawn on Thursday, October 18th, Hossein Nosrat Abadi, 37, was hanged to death in Sirjan Prison. Convicted of committing murder during a 2016 home burglary, Abadi was unable to obtain a death row pardon from the family of the victim. By hanging Abadi in silence, authorities — particularly the judiciary — demonstrate a continued pattern of obfuscation on the topic of executions, in spite of their duties to inform the public. The research of international human rights organizations indicates that Iran has the world’s highest rate of executions per capita. 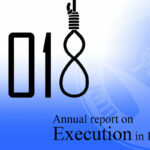 HRANA published its annual death penalty report on October 10th, the World Day against the Death Penalty. Sirjan is located 600 miles southeast of Tehran. Human Rights Activists News Agency (HRANA) – Ayoub Jahandar, 28, was executed at Ferdows Prison in the early morning hours of October 14, 2018. A close source related to HRANA that Jahandar was sentenced to death for homicide and armed robbery after killing someone while holding up a Ferdows jewelry store in 2012. “Jahandar’s brother was sentenced to 15 years in prison for colluding with him on the robbery,” the source added. Ferdows Prison is in the city of Ferdows in South Khorasan Province. Fewer than 300 people are held in this small prison. Reports of executions here have been rare in recent years. 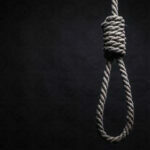 Human Rights Activists News Agency (HRANA)- On the World Day Against the Death Penalty, the Center of Statistics at Human Rights Activists in Iran (HRAI) has published its annual report, in efforts to sensitize the public about the situation of the death penalty in Iran. HRANA’s Statistics Center relies on the work of HRANA reporters, as well as a network of independent and verifiable sources. It also incorporates disclosures to the media by judicial authorities announcing or confirming prisoner executions, and as such is exposed to a margin of error representing efforts by the Iranian authorities to omit, conceal, or restrict the collection of such data. Between October 10, 2017, and October 9, 2018, the death penalty and executions have been the focus of 287 HRANA reports. 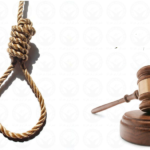 Over this time period, the Iranian authorities issued the death penalty sentence to 240 individuals and have already carried out 256 executions; [that’s one hanging every 34 hours for a population about twice the size of California’s]. 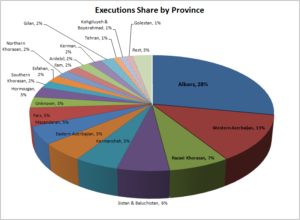 Six percent of the executions in Iran were carried out in public. 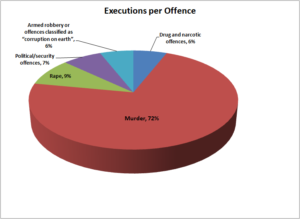 Females account for only three of the 256 HRANA-confirmed execution victims this year. Five were under the age of 18 when they allegedly committed the crime they were charged with. While execution numbers went down by 50% in comparison to the same time last year, Iranian courts have issued 7.4% more death sentences. Public hangings and executions of women have gone down 54% and 50%, respectively. 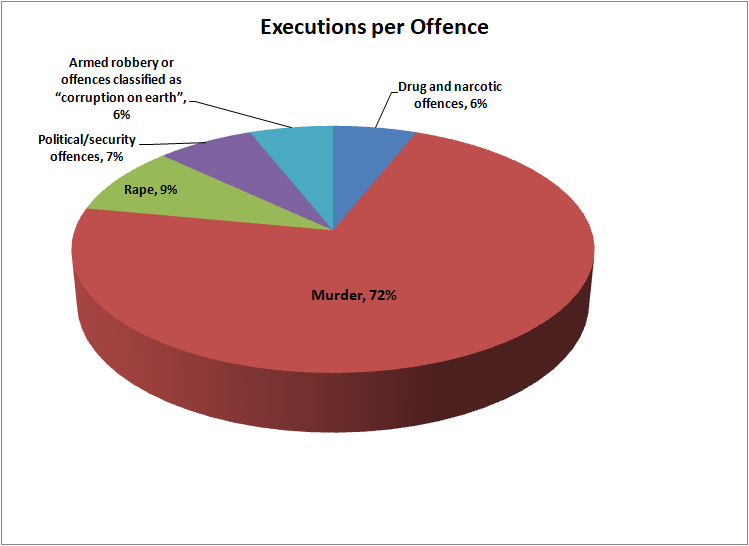 The chart below displays execution numbers by the province in which they took place. 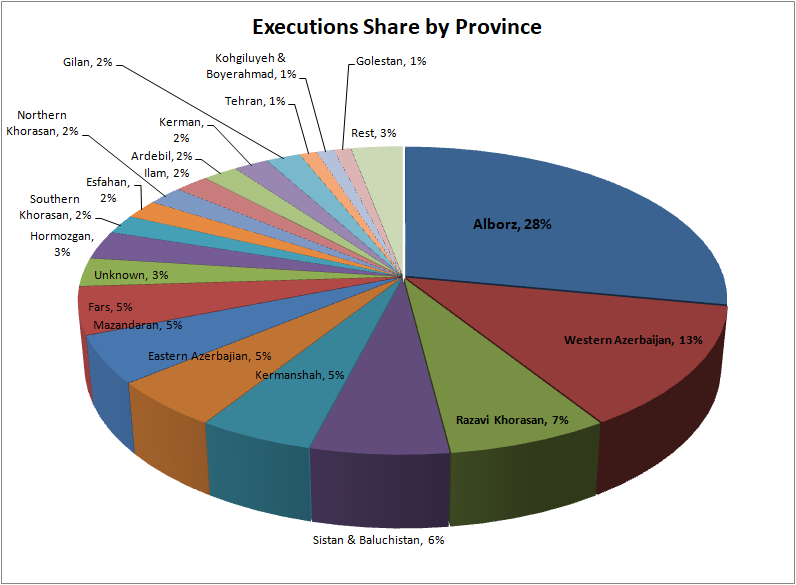 Below is a distribution of execution information sources. 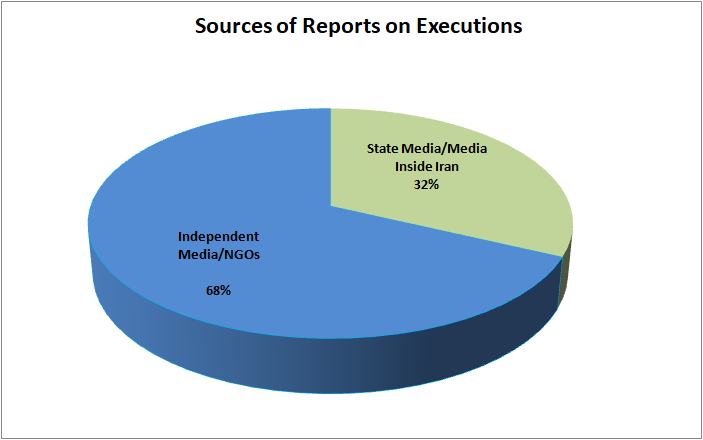 The chart indicates that 68% of HRANA-confirmed executions were not announced by official Iranian sources. Undisclosed executions are referred to as “secret” executions.